Unusual line ups that seem to omit what was once to be perceived as an essential part of a group or ensemble are now such a frequent occurrence that they no longer seem unusual, so much so that we no longer bat an eyelid (or miss a beat) when presented with such music. 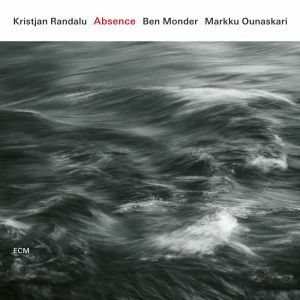 It should therefore come as no surprise that pianist, Kristjan Randalu, should believe that it is more than acceptable to present a piano jazz trio without a bassist, and on this outing more than justifies the decision. The trio here, with two chordal instruments, was created specifically for this recording after a suggestion by producer Manfred Eicher. As is his wont, this is no casual 'let's put'em together and see what happens' affair, but a well thought out project that re-unites Randalu with guitarist Ben Monder who have previously recorded as a duo together, and the introduction to the mix of Finnish drummer Markku Ounaskari. Pianist and drummer are also well acquainted having worked together regularly in Trygve Seim's Helsinki Songs project (which has also recorded for ECM and reviewed in our October reviews). The material for Absence is all penned by Randalu, and has been much of the music has been part of the pianist's solo repertoire for many years. In this setting, the trio feel free to take an exploratory route, with Monder's guitar equally at home providing an ethereal electronic backdrop to Kristjan's searching piano figures as on 'Escapism' or a more lyrical and driving approach as heard on 'Forecast'. With the new trio, the pianist is clearly hearing things in the music that he has not perhaps explored before, and as he delves deep in to the chosen pieces, so Monder and Ounaskari are keen to follow. With such a variety of sounds and timbres produced by the electric guitar and brushes and sticks on skin or metal the soundscape that surround the piano bring a rich tapestry of sounds that allow the music to ebb and flow, whether a strict tempo is explicit or implied or even non existent. What is apparent throughout is the chemistry between the three musicians. Music of this nature can often quickly become meandering or self indulgent, but there is no danger of that in this compact and controlled set. The music is self contained, even in places where a freer approach seems to be presenting itself, the trio are able to adapt a collective discipline that ensures that the compositions are always kept sharply in focus. This in turn produces music where there are clearly solos, but such is the interplay of the trio that the solos are at one with the accompaniment, rather than seeking to dominate the moment. An interesting and engaging leader debut for the Estonian pianist, and it is hoped that ECM have plans to document more from this talented and creative musician.